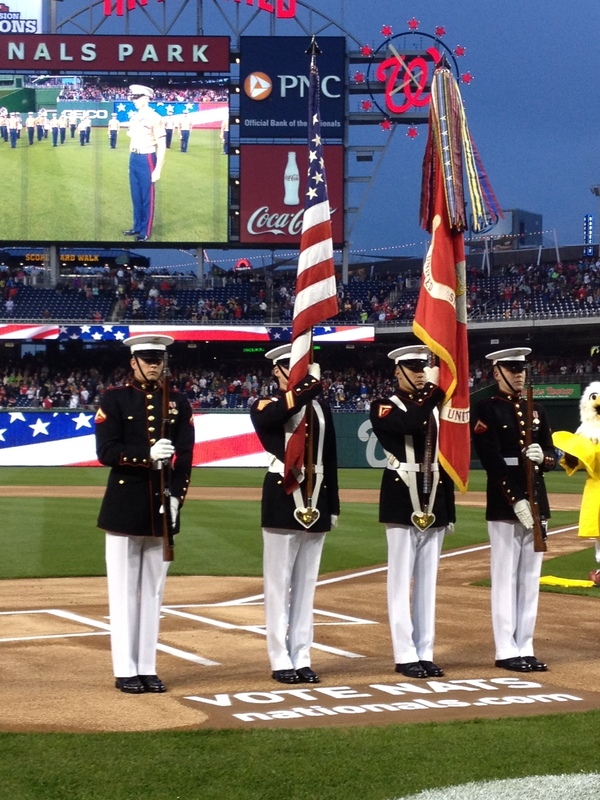 Nationals Park was regaled in Marine imagery Wednesday night as part of the Military Branch Day program meant to honor each of the nation’s services in turn. The Wednesday event, sponsored by the Marine Corps Scholarship Foundation, included a Marine-themed pre-game show featuring the Quantico band, scholarship awards and an opening pitch by Lt. Gen. Willie Williams, director of Marine Corps Staff at Headquarters Marine Corps. 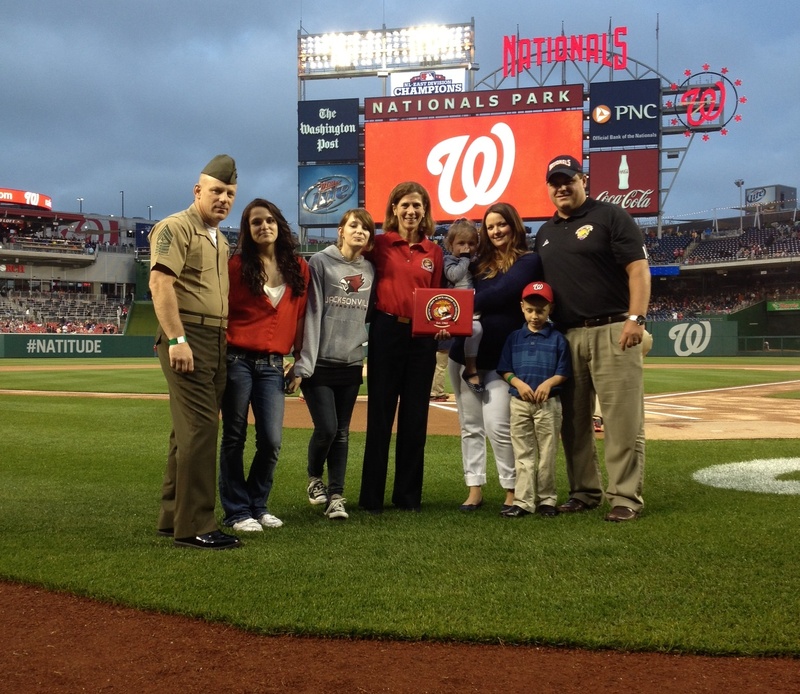 Among those recognized with scholarship eligibility for his children was former Staff Sgt. Jeremiah Workman, who awarded the Navy Cross for actions during Operation Phantom Fury in 2004 in Fallujah, Iraq. With other members of 3rd Battalion, 5th Marines, he fought his way through machine-gun fire and grenade blasts to help save Marines trapped in a house by insurgents. The fighting left three Marines and at least 24 insurgents dead. Workman was peppered with shrapnel. Also recognized was combat-wounded Sgt. Maj. Joseph E. VanFonda, who served as the Wounded Warrior Regiment’s sergeant major until this week and is now slated for retirement after 27 years of service. He received scholarship eligibility for his two children. All Marines and corpsmen — current and former — are eligible to apply with the foundation, which helps fund educational opportunities for the sons and daughters of service members with demonstrated financial need, giving special consideration to the kin of those killed or wounded in combat. To apply, visit the foundation’s website. The organization, founded in 1962, provides approximately 2,000 scholarships each year, totaling about $6 million. Since its founding it has provided more than $70 million to help young adults pursue higher education. The scholarships are welcome relief for Marine families, VanFonda said. At WWR he consistently directed Marines to valuable resources including the scholarship foundation which will now help defray some of the costs to put his two children through college when the time comes. He said it is of critical importance that leaders continue relaying opportunities with the foundation to their Marines and corpsmen. In some cases, service members can transfer their Post-9/11 GI Bill benefits to their children, but Margaret Davis, the foundation’s president and CEO, said those benefits should be retained for the individual service member. An education, she said, is now critical to a successful transition out of uniforms, so her organizations goal is to augment benefits provided by the government to ensure both Marines and their children can pursue higher learning. “If a Marine starts splitting the GI Bill, they are always thinking of their family first, there isn’t much left for them,” she said. To spread the word, she and her organization have worked with leadership to include information about their scholarships in senior leadership classes, hoping those leaders will relay the opportunity to their Marines. Training and Education Command and Sergeant Major of the Marine Corps Micheal Barrett have been extremely supportive, she said. The Nat’s beat out the Detroit Tigers 3-1 at the game. The Navy was honored April 12 and future games will honor the Army, Coast Guard and Air Force on June 20, Aug. 5 and Sept. 19 respectively. For more details on Military Branch Days, visit the Nat’s officials website.